When it gets chilly outside it’s about time for some chili on the table. Besides soup, this hearty stew is just the ticket when coming home from the cold, because a good chili is just so comforting and warming. 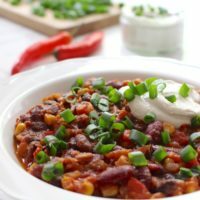 Now is this the best vegan chili? Well, it’s the best I’ve ever made (and probably even eaten), and there have been quite a few. Namely it did take a few attempts to make a vegan chili this delicious and in the end it turned out to be pleasantly spicy while being hearty and tangy. I probably don’t need to mention that this chili is sin carne (=without meat). 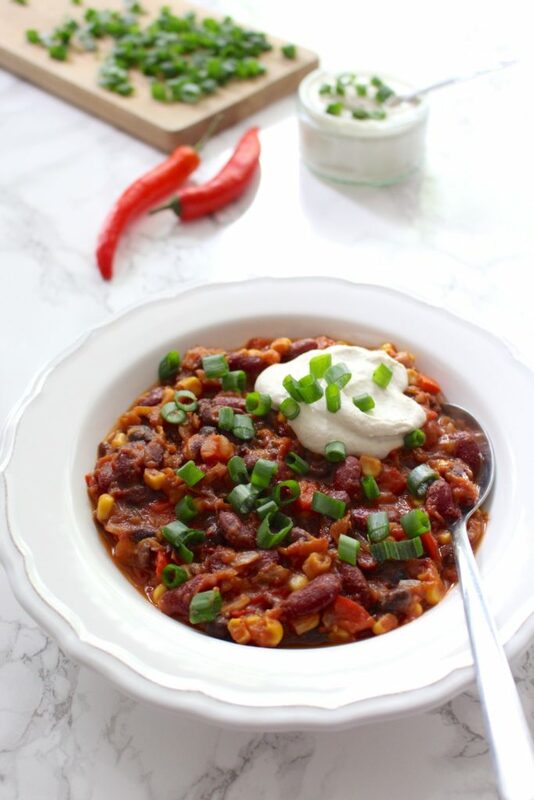 Probably the best thing about this vegan chili is that you most likely have all the ingredients on hand anyway and it’s just super easy to make. If you feel like experimenting a little, feel free to try it with dark chocolate. Yes indeed, chocolate. You may know the combination of chocolate and chili from chocolate bars already. It just works. And it does the other way around as well. When it comes to deglazing, I would just vary at whim. Sometimes I’d use red wine, sometimes white, sometimes I’d use balsamic vinegar or nothing at all. However, what can not be missed is this delicious sour cream made from cashews. I would eat another bowl of chili even if I wasn’t hungry anymore, just so I could have another blob of this sour cream. Seriously, it’s that good. Like most stews, chili tastes even better when the spices can be absorbed through resting for a few hours or overnight. So preferably make this chili a day before serving. 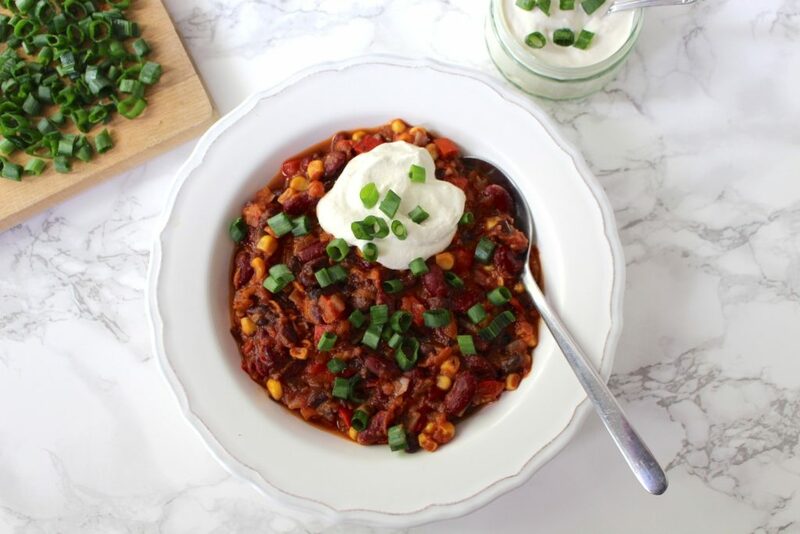 This vegan chili sin carne is hearty and warming and therefore makes the ideal fall and winter dish. It tastes even better the next day. With a blob of vegan sour cream it's just about the perfect comforting stew. In a large pot, lightly braise onion, garlic and chili in some oil. Add bell pepper and sauté for 3 minutes, stirring occasionally. Deglaze with a dash of red wine. Drain beans and corn and add to the pot, together with carrots, tomatoes and passata. Add enough vegetable broth (or water) to cover everything and let simmer on low for about 20 minutes. Add chili flakes, paprika, cumin, ginger and chocolate (if using) and cook for another 15 minutes or so. Season with cinnamon, tabasco, salt, pepper and cayenne. Garnish with a blob of sour cream and spring onion before serving. Preferably make this chili a day before serving and let rest in the fridge overnight. Instead of red wine, you could use white wine, balsamic vinegar or even coffee or beer for deglazing. I highly recommend serving the chili with this cashew sour cream. I hope you love this recipe – please let me know in the comment section below! 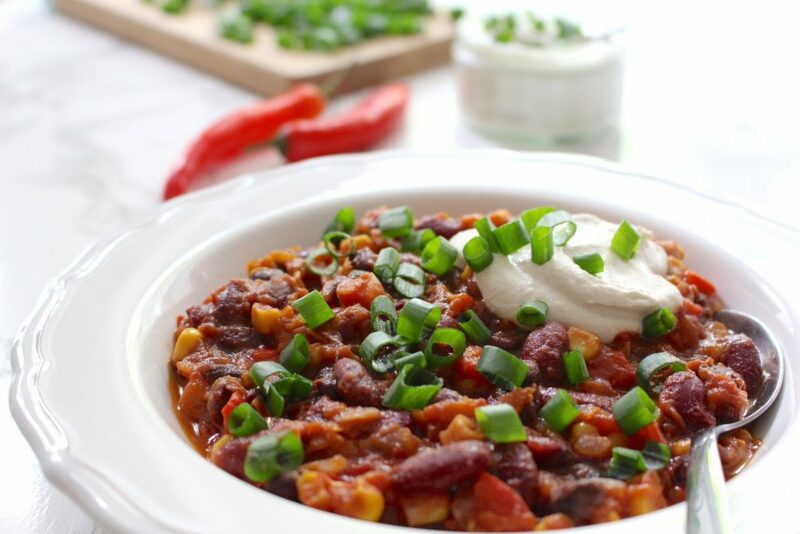 If you make this vegan chili sin carne, make sure to take a photo and share it on my Facebook page or on Instagram, using the hashtag #minamadefood. Oh and don’t forget to tag me (@thisisminamade) so that I can see your creations!